Whiskers sits on Suzanne's glove during her first flight reconditioning session. Photograph by Suzanne Shoemaker. 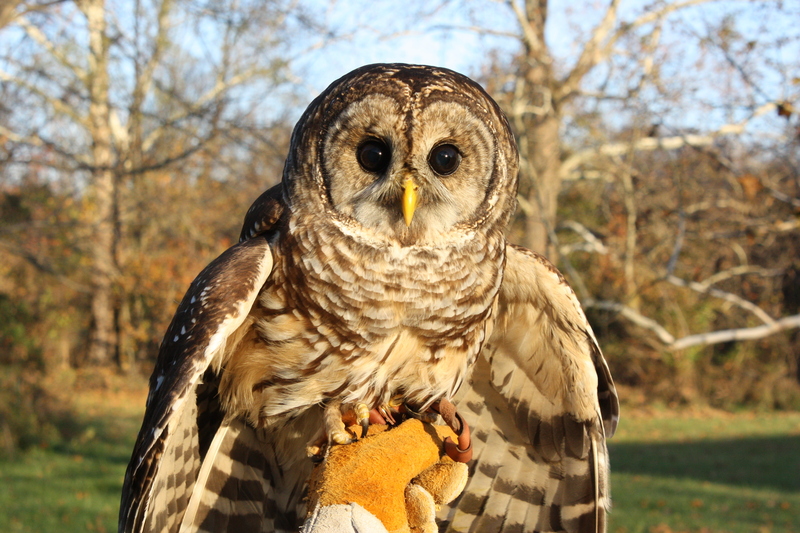 Owl Moon received a new patient this week, a juvenile female barred owl transferred from Second Chance Wildlife Center in Gaithersburg, MD. 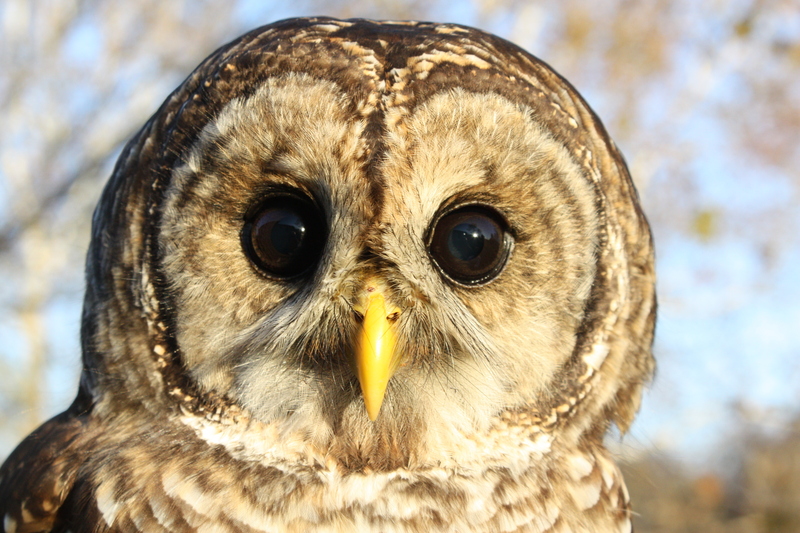 We have been calling her “Whiskers” because, as is typical of juvenile owls, her face is fuzzier than an adult’s. Whiskers arrived at Second Chance on Oct 17th. She was found along a road in Upper Marlboro, MD, but it wasn’t clear if she had been hit by a car. Second Chance found no injuries and, though very thin and dehydrated, she was alert and responsive. Second Chance gave her fluids for the next several days, as well as non-steroidal anti-inflammatory drugs (NSAIDS). The NSAIDS served two purposes, they would alleviate pain and swelling in case she had been hit and incurred undetected soft tissue injury, such as bruising. Secondly, they would help in case she had contracted West Nile Virus. Though she was not exhibiting the classic central nervous system symptoms, this is a busy season for West Nile in birds. Symptoms can vary widely and juveniles are frequently victims. Because no clear reason could be found for her condition, NSAIDS were given as a precautionary measure. two mews are 10’x12,’ and up two 8’ high in back. This is large enough to allow recovering raptors space to stretch their wings and fly short distances from perch to perch, the next step toward release. 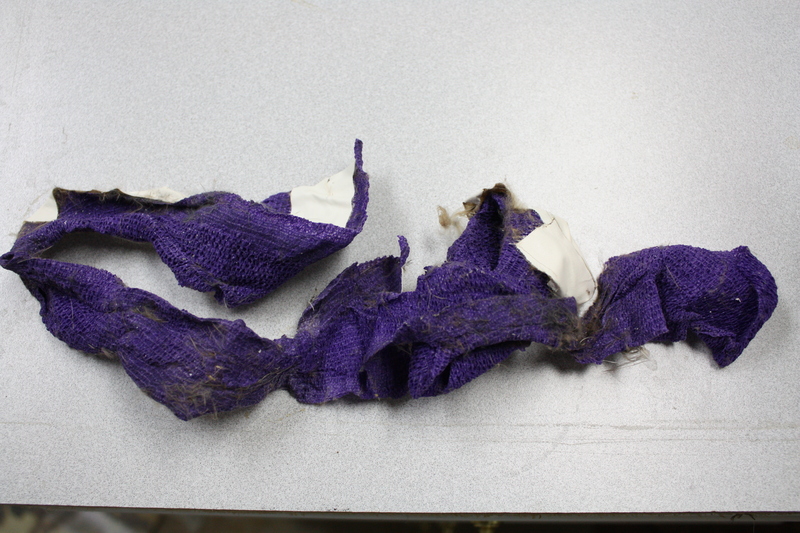 This is what Shredder's bandage looks like when it is applied. Photograph by Suzanne Shoemaker. This is what Shredder's banage looks like when it comes off. Photograph by Suzanne Shoemaker. In her first week at Owl Moon, Whiskers has continued to gain weight, and received her first session of flight exercise on a creance line. She flew beautifully right off the bat, so I am confident that she can be released after a couple more weeks of reconditioning. “Squeek-toy,” the juvenile red-shouldered hawk, is getting flight time on the creance too, as well as physical therapy exercises. We flex and extend his injured wing to stretch the retracted muscles, and rotate it to increase range of motion at the shoulder joint. While his flexibility is improving, he appears to have some soreness afterward. We hope he will regain full use of the wing, but we won’t be pushing him too hard or too fast. 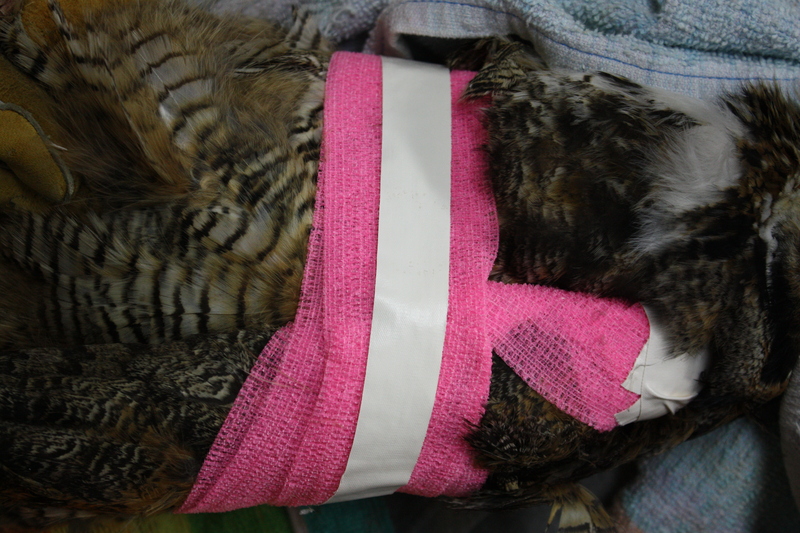 Meanwhile, I am pleased to announce that “Shredder,” the great-horned owl, is bandage-free, and glad of it! The fracture of the humerus of his left wing has formed a callus, and he holds the wing in a nearly normal position, a good sign. I will be scheduling a follow-up appointment for him next week with Dr. Stastny at Opossum Pike Veterinary Clinic, so I will have a more complete report next week. If all is well, he will be following Whiskers into the outdoor mews soon. In this close-up Whisker's whiskers are clearly visible around her beak. Photograph by Suzanne Shoemaker.